So it is now 6 years down the line and we have already impacted the lives of over 6000 people from various companies. From Board Members, Directors, CEO’s, Heads of Department, right down to the humble Cleaners and drivers in various organisations. We have worked with people in the Mining industry, Banking, Government, Parastatals, Conglomerates, Small businesses, Churches, Schools and Corporate Companies. The one thing that is always relevant, valued and needed is very simple – Respect. Respect for one’s culture, religion, knowledge, experience, life’s experience, wisdom, upbringing, ancestry and individuality. The one underlying cause of lack of respect within the workplace seems to always stem from thee most simplest challenge. The lack of communication and understanding that each person is different and wishes to be respected in their own way. Respect in the Workplace: Respect! Period!. 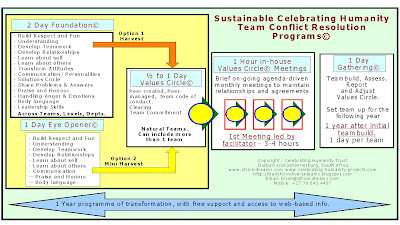 This entry was posted in Arthie Moore, break barriers, brian v moore, building teams, Celebrating Humanity on FaceBook, Clear workplace conflict, Diversity Training in South Africa – New Site and tagged accountability, diversity, learning styles, personality types, respect in the workplace, team work, unity by Brian V Moore. Bookmark the permalink. 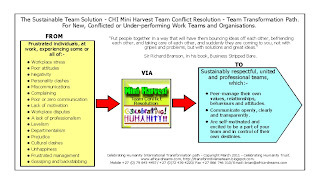 Team Building in South Africa, Team Conflict Resolution and Diversity Management Consultant and EFT Therapist, – Brian V Moore is often described as a Breyani Mix as he is of Irish, English, Welsh and Scottish ancestry, was born in Northern Rhodesia (Zambia), of South African parents, was raised in Port Shepstone, became a member of a Zulu tribe and married into a South African Indian family. He has been the catalyst for Celebrating Humanity International – formerly Mthimkhulu International – and focuses on building respect, accountability and unity within diverse teams, removing conflict within teams, diversity management training and transformational team building. He and Arthie have created the Dream Dynasty programme – to put the dream back into education and the Legacies Africa campaign. 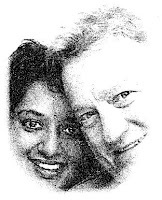 Together they have created the Team Building in South Africa and the Diversity Training in South Africawebsites. He now has a new website. Connect here with Brian V Moore. Diversity Training in South Africa – a member of the Celebrating Humanity International stable has a brand new website. So too, does the founding director, author and diversity speaker – Brian V Moore. Learn more about fellow director, writer and powerful catalyst of change – Arthie Moore. 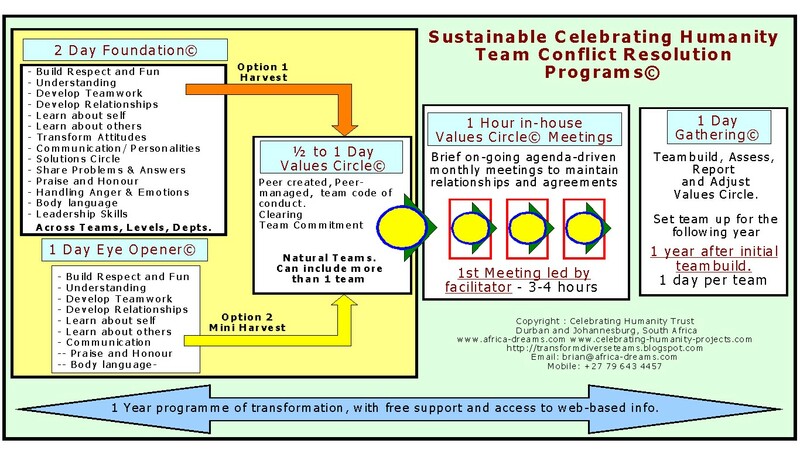 Read up and contribute to Arthie Moore’s blog on Relationships, and visit our Transform Your Diverse Teams blog and the Ways we Learn, Teach and Present blog. Get your diversity training proposal, team building proposal or team conflict resolution proposal from either site. Traditional and Western Leadership has a legacy of “I tell – you do.” Although there is a growth in the concept of participative leadership this is not enough. The young man and lady slouched back in their chairs during a recent 1 day Celebrating Humanity diversity training session. She spoke up, “This is brilliant. But where are the managers and directors?”. • there is full ownership for their personal behaviours and actions, from all members of the organisation – from board level to the general workforce. • all team members are valued, feel valuable and value the uniqueness and difference in others. • all are part of a team where everyone operates within a peer-selected, peer-managed set of positive and values and behaviours and actively exclude non-acceptable behaviours from their interactions. 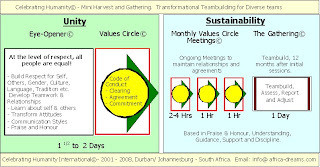 • a peer-controlled inter-personal values-based structure is constituted and managed on a regular basis. • A separate set of organisational values/ principles has been developed and accepted by all role players to ensure that issues such as client relationships, theft, corruption, fraud, professionalism are all adequately covered by company regulations. It is critical that no-one is above the rules of inter-personal respect and organisational values. Leaders lead and work with people. Leaders are accountable to self, team and company. Traditional managers manage resources. They are only accountable to their seniors. 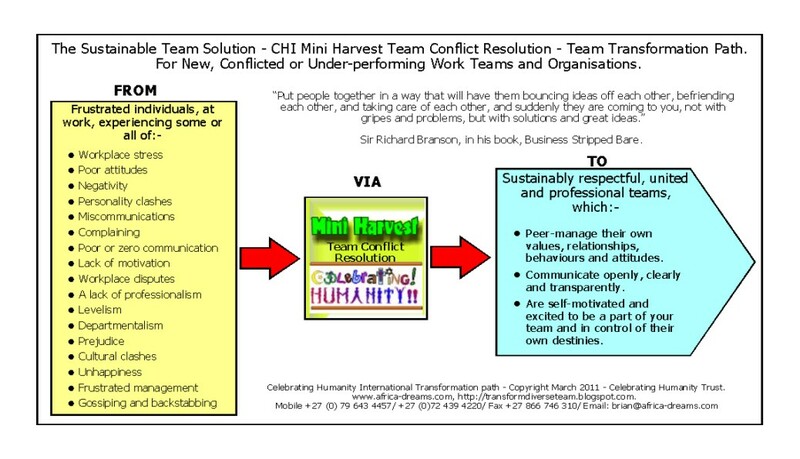 The well-known Celebrating Humanity Team Conflict Resolution program has been designed to accommodate teams that are pressed for time and large organisations. The Harvest program, with an initial 2.5 to 3 days session, gives participants extra time to develop leadership, solutions to challenges and advanced communications skills. The Mini Harvest program, with an initial 1.5 to 2 day session, is tightly adjusted to build the team in as short a time possible. 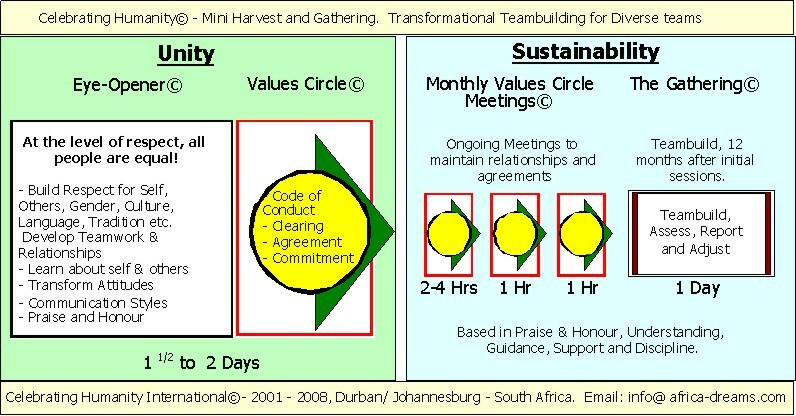 Both programs have the Values Circle Process to clear the past, get commitment and a peer-developed code of conduct – to guide the team into the future. The follow-up processes and programs ensure long lasting and powerfully inclusive change. Check out our website for more information. Or email Brian V Moore.